Now, it’s one thing for a full-time professional tennis player to reach that number of matches. It’s another thing for a Tennis League Network (TLN) recreational player, who works full time, to play that much tennis. After all, tennis is what Andy Murray does for a living. On the other hand, it’s also not so unusual for Valentin—who is clearly obsessed with tennis. “As of now (Sep 3rd) my 2012 total number of matches played in the league (from Jan 1st until Sep 1st) is 110.” it’s one thing for a full-time professional tennis player to reach that number of matches. It’s another thing for a Tennis Los Angeles recreational player, who works full time, to play that much tennis. After all, tennis is what Andy Murray does for a living. On the other hand, it’s also not so unusual for Valentin—who is clearly obsessed with tennis. Now, it’s one thing for a full-time professional tennis player to reach 53 or more matches. But it’s another thing for a TLN recreational player, who works full time, to play that much tennis. After all, tennis is what Andy Murray does for a living. On the other hand, it’s also not so unusual for Valentin—who is clearly obsessed with tennis. “As of now (Sep 3rd) my 2012 total number of matches played in the league (from Jan 1st until Sep 1st) is 110," Valentin says. So move over, Mark Stern of Boston (Tennis Northeast), where Valentin previously played, your record of most matches played – 50 matches in fall 2011--has been smashed like an overhead. 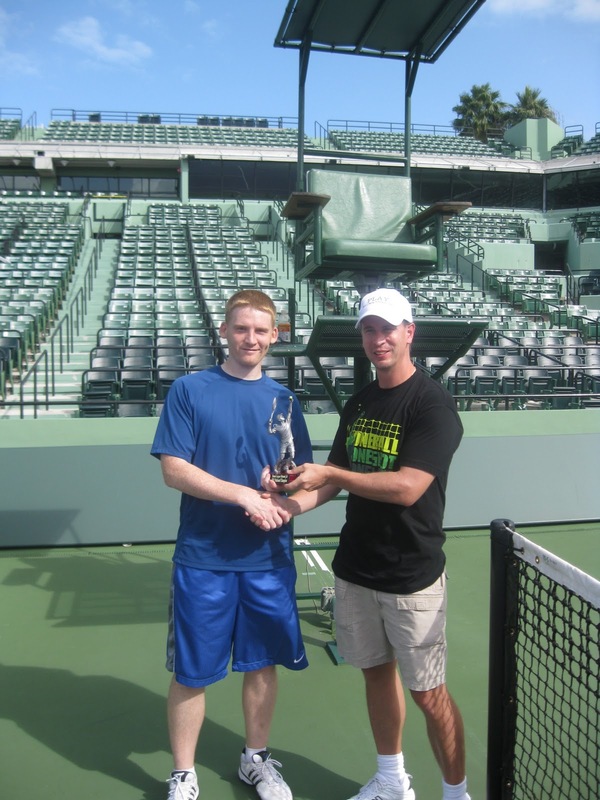 Although Valentin used to play on your side of the court there in Boston, he's a newly promoted 3.5 player who’s been playing with Tennis LosAngeles since September, 2010 He's now the record holder: http://tennislosangeles.com/info/MatchesInSeason. If you could ask him a question, would it be this one? 8 years and 502 tennis matches later and this game still challenges, entertains and keeps me fit. My name is Steve Chagnon, the owner/lead administrator for the Tennis League Network (TLN), an online tennis community that matches players of similar levels. 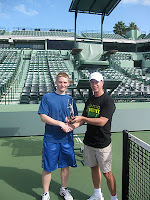 You might know the program as one of 30 city based programs: TennisDC.com, TennisLosAngeles.com or TennisNorthEast.com. A quick background on me . . . I grew up being a sports fanatic. I had a childhood baseball addiction, which eventually led to my love of basketball through my 20's. Basketball is a great team sport but it's brutal on the ankles and knees. It's also quite humbling when you barely get into your mid-30's and you lose your outside shot. Through the years tennis was always in the background but it took front and center when I entered my 30's and my basketball skills faded. For me, the beautiful thing about tennis is that there really was only one period where I got pretty good. At my first job out of college with EMC Corporation, a co-worker and I would hit the courts once a week, to just hit around or play matches. Within a few short months we both had elevated our games to a point where winners were becoming commonplace and playing rallies was the norm. This was all lost when I ended up leaving the company. No more partner. No more tennis. It took about 7 more years before I found a local program and started to play competitive singles matches. But the program had some major flaws, mainly that it relied on postal mail to connect players together, phone calls to post score updates. Things moved slowly, if they moved at all. Eventually, they stopped moving, and the league was entirely shut down. So, the concept for TLN the program grew out of my continued desire to compete in a fun and engaging sport. That’s what tennis is. It doesn’t matter how old you are or how athletic – just get out on the tennis court and you can see improvements within a short period of time. All you need is either a wall to hit against, an instructor or a tennis partner. The program's true foundation is that we find you passionate tennis players who love the sport of tennis to meet up with you, a “stranger to them”, on the courts. Call us the match-maker of the online tennis world. But it’s not a singles group and there's no dating, just the initial awkwardness of meeting up with a new potential tennis friend. This leads to exchanging forehands and backhands and hopefully lots of rallies. So TennisNorthEast.com was born, the Metro Boston Tennis League - the first, the original, and now the 3rd biggest community in the 30-city network. The program and its format has changed dramatically over the years, with constant feedback from the community, and implementing changes to make this the truest form of Flex League available. What’s all the fuss about, you ask? Play as much as you want during an 8 to 9 week season. If the first match was a barn-burner, then get out on the courts again and play a rematch. Women who win 4 matches or men who win 5 matches during the regular season qualify for the playoffs. The single-elimination playoff format is where the champions are crowned. City champions are then eligible to go to our national championship, which is held yearly in November at the gorgeous Crandon Park Tennis Center in Key Biscayne, Florida. Time has passed since that first league kicked off. Here I am still playing, 502 matches later, with a marginal (at best) record of 251 wins and 251 losses with 3 losses in championship finals. I'm a struggling 3.5 player needing to hold serve way more often than I currently am. But, I'm constantly striving to improve aspects of my game as I still AIM to eventually win a championship. Spring is nearing and it's time to get physically prepared for the 2012 outdoor season. Sadly, for us up here in Boston, it doesn’t start until late April, unlike the players in LA, Orange County, and most southern cities where they get to play outdoors year round. This year, Tennis League Network will surpass its 100,000th match played. The program has evolved over the years and will continue to evolve, by listening to the community, which is the only way to make sure we're trying to deliver the best product possible. Though I have my own 502 matches under my belt, I certainly intend to keep going, and think 1,000 matches is a good target. By the time I reach it, perhaps a player in Los Angeles or Orange County will have surpassed me. If you get there before me, then a lifetime membership in the program will be yours. Good luck!